This photo is of a horse that had sarcoids on his muzzle. 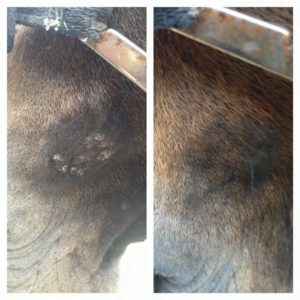 After 5 weeks of dedicated treatment on he part of his owner using the methods below the sarcoids have disappeared. keeping up with an immune boosting program will help prevent their return. A sarcoid is basically a type of skin tumour believed to be caused by a virus. There is a possible link between a poor immune system and sarcoids. As a sarcoid develops it forms new blood vessels to ‘feed’ it with oxygen and nutrients. This process is called angiogenisis. Smooth and nodular and can become very large and multiple. Flat, slightly bumpy with areas of hair loss. As they grow they may become ulcerated and infected. They are found on the inside of thighs, on or around the sheath and udder, behind the elbow and girth area, under the belly and on the head and neck. Enhancing the immune system so that the body will kill off any pathogen causing a sarcoid or tumour to form . Cutting off nutrient and oxygen supply to tumour or sarcoid by preventing the formation of new blood vessels to ‘feed’ it. Applying a tight elastic band around the base of the sarcoid. Only suitable for tumours with a narrow base. There is usually quite a lot of swelling and some discharge before the tumour drops off. Surgical removal, cryosurgery, injection of BCG vaccine. Creams that will ‘attack’ any abnormal cell proliferation. 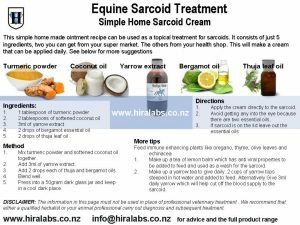 Here is a simple sarcoid ointment recipe that you can make up yourself. 5ml of Yarrow extract taken internally seems to be the most effective in that it appears to affect/constrict the blood supply to the ‘tumour’due to its anti-angiogenesis properties. (Angiogenesis is the point at which a cancerous mass forms blood vessels to supply the tumour/sarcoid with blood and oxygen) Yarrow also has a positive effect on capillary walls by trengthening vascular walls which incidentally may help with the IAD. Thujone is one of the active ingredients in yarrow may be used to treat warts and sarcoids. Thuja is a recognised wart herb with its main active ingredient being thujone. Yarrow extract may also be applied to the sarcoid daily as well. To assist in the metabolism of the supplements and to improve skin condition. Echinacea 5ml daily to activate immune system and provide antibiotic cover. Apply twice daily using a cotton bud, a tincture blend of yarrow and bergamot. Homeopathic thuja and causticum 60 may be given internally.